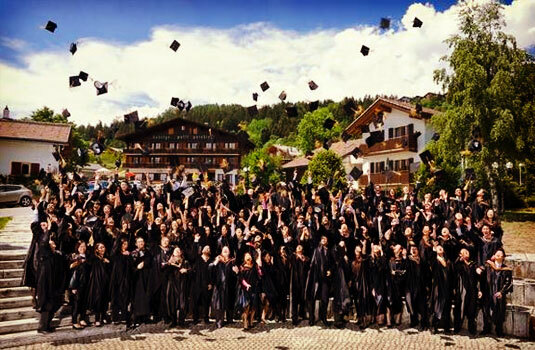 Share the post "217 BBA, PGD, BSc and MBA students graduate from Les Roches Switzerland"
Les Roches International School of Hotel Management celebrated its Graduation Day of the BBA, PGD, BSc and MBA students of the 2011.1 semester at its campus in Bluche, Switzerland. Witnessing the historic moment in the audience were guests, faculty, parents and relatives of the students. A total 217 students graduated this semester at one of the best hospitality management schools in the world. Part of the graduation ceremony was the presentation of several individual prizes. Sophie Le Baux from France was awarded with ‘Audemars Piguet Swiss Learning Prix d’Excellence’, an award combining academic performance, contribution to student life, contribution to Les Roches in general and future success in Hospitality Management. Nahla Abdel Aziz from Egypt was awarded the prize for the top academic BBA student. Yug Tuli from India became the top academic student from the MBA graduates. Suzie Hodge (GBR) was honored as the top academic PGD student. Katharina Kluschat from Germany received the prize as top academic student from the BSc class.